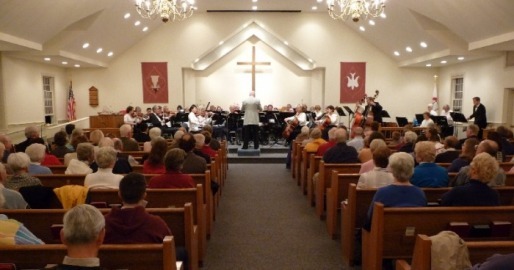 The Cape Community Orchestra, under the direction of John P. Hagon, presented the first of two concerts yesterday, May 4, at the Church of the Holy Spirit in Orleans. The second concert in the series is Friday, May 9, at 7:30 PM at the Northside United Methodist Church on Airline Road at the Brewster/Dennis town line. The concerts are free, but donations are appreciated. I am happy to be a cellist in this orchestra. And I encourage you to attend the upcoming concert on Friday. The first was well-attended, and the audience seemed impressed with the music, giving us a standing ovation. It was nice to hear the people near us gasp, “Wow!” when we finished a piece. My thoughts exactly, especially for the more challenging works. The program includes two movements from Antonín Dvořák’s “New World Symphony: the much loved Largo (Goin’ Home) movement and the lively final movement. We start with “Variations on a Theme by Haydn” by Johannes Brahms, and conclude with “Ballet Parisien” by Jacques Offenbach. In between, we perform a medley of operatic melodies used in films, “Opera Goes to the Movies,” the Berceuse and Finale from Stravinsky’s “Firebird Suite,” and Tango in D by Isaac Albeniz. The Cape Community Orchestra is an all-volunteer orchestra with members from Falmouth to Truro. We rehearse Wednesday evenings from September to May, performing concerts in November and May, plus concerts at elementary schools in February.